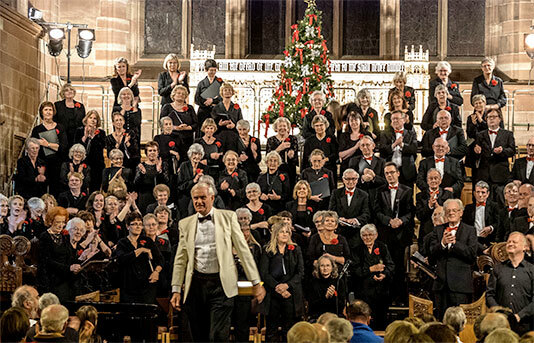 Hertford Choral Society (HCS) is a non-auditioned community choir ​and registered charity ​based in Hertford. Its origins date back to September 1938 and, working together with the Oral History Team, it is celebrating its 80th anniversary in 2018/19 by recording some of its 135 members, and its musical director, talking about​ their experiences of the choir. Throughout its history, HCS has recorded a number of significant musical achievements. It gave the very first performance by an amateur choir of Scarlatti's then newly-discovered ten-part Stabat Mater in 1950. ​It has also​, for example, performed with other Hertfordshire choirs at the ​R​oyal Albert Hall on four occasions (Britten's War Requiem, 1994; Mahler's Symphony no.8, October 1999; Verdi's Requiem, 2003 and Berlioz's Grande Messe des Morts, 2007) and travelled to Hertford's twin towns of Evron and Wildeshausen (the latter in particular many times including return visits and a planned trip of members to Germany in October 2018). ​The choir gave one of the first amateur choir performances of Michael Berkeley's Or Shall we Die?​ in 1987. ​It has sung with a number of notable soloists over its history​ including Peter Pears,​ John Carol Case, Ilse Wolf, ​​Lesley Garrett, Ian Bostridge, Emma Kirkby, Tracey Chadwell and David Wilson-Johnson​, and it has recorded four professionally-edited ​albums​ (1991, 1996, 2009, ​and 2016). The choir's Presidents have been David Wilson-Johnson, Brian Kay, Sir Norman Lindop​ and, at the time of the recordings, the composer and broadcaster Lord Berkeley of Knighton – Michael Berkeley, CBE. The recordings mainly took place on Saturday 16th June 2018 at the University of Hertfordshire and in the company of Oral History Team members Anne Murphy, Jenny Dart and Andrew Green. This timing was extremely fortunate, coming as it did just a week after a wonderful HCS concert performance of Vaughan Williams’ A Sea Symphony in St Albans Abbey, and just before the summer break and its next – and 80th – season. Nine choir members were trained to interview fellow singers/MD and the result is a fascinating oral history, contained in 30 separate interviews, of life inside a choral society. 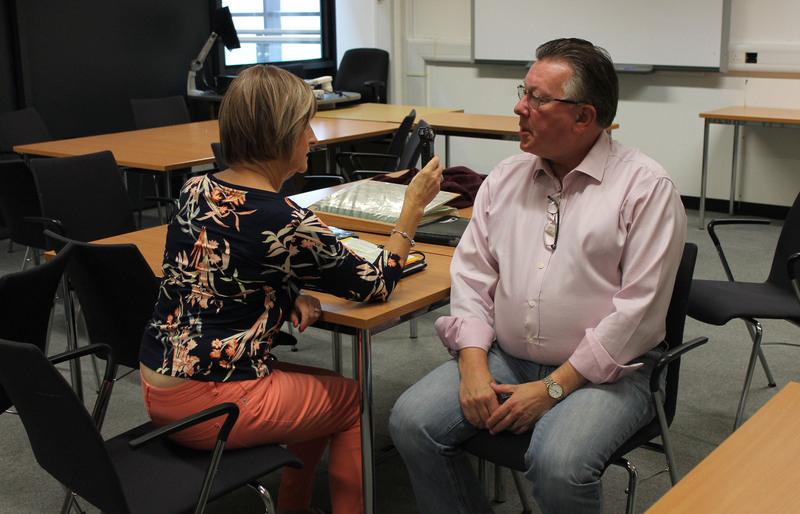 Warm thanks are extended to the University of Hertfordshire Heritage Hub for making this initiative possible, and to all the people who took part – both as interviewers and interviewees and, in some cases, both! Between us we have created what we believe to be the very first oral history of a UK choral society, a perfect accompaniment to the written History of HCS which will be published in September 2018, and a wonderful legacy for families, friends and generations of singers to come. It has been a fascinating and rewarding project and one in which it has been an enormous privilege to take part. Please visit the Hertford Choral Society website for full details about the choir.